The Time Machine: Moondance Diner - Late Update! 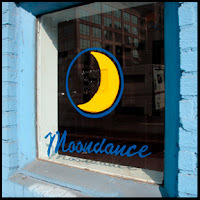 Moondance Diner - Late Update! It never occurred to me, as I re-took my pictures for these pages last June, that I'd have to be doing an update anytime soon. So many of those old scenes had been altered beyond recognition that finding an unchanged neighborhood made me feel as if it were safe and protected, perhaps for the next few decades. But the Moondance had been on Sixth Avenue for years, it was on TV shows and in the movies, it had a steady clientele and a great big sign made out of silver spangles, with a huge revolving yellow crescent moon. They had great pancakes, and they put cinnamon in the ground coffee before brewing it. It had an obligation to be there! Alas, land values in Manhattan being what they are, and what with the urgent, war-time need for overpriced luxury apartments, the lot was sold for residential development. Yet the diner, or at least the original railcar-style building, was sold separately to a couple who put it on a flatbed truck and drove it to LaBarge, Wyoming. Once there, they'll add kitchen and storage extensions, and open it as the only restaurant in town. Sixth and Grand will be served with, I assume, another oddly shaped glass tower. On our first ever venture into Manhattan (quite literally a spur of the moment decision), the Moondance beckoned as we navigated 6th Ave at around 9:00 PM on a Saturday night in early December '88. There was actually an empty parking spot right at the door, so we were obligated to drop in for pie and coffee.... Had always hoped to return, but with Wyoming being 2,000 miles away, I suppose we'll have to be content knowing we were 'there' when it was still an icon of Lower Manhattan. Basically, I needed to get online again, but I wanted something different than I'd been doing in the past. I didn't want to simply regurgitate all the Postcards From Monkey Island into a blog format (although if you clicked on that link, you'll see that I have done just that, although it's not all the Postcards, and it looks so much better in the new format), and I don't need a gallery-type site: I've got one of those elsewhere on the web. It was only after I began scanning a bunch of black and white negatives that I began to realize the trove I had: Dozens of pictures of New York during the 1980's, when it seemed there was a perpetual cloud of crack smoke hanging over the city. I started cleaning them up, and posted a few in a couple of photography message boards. The feedback was good, so I decided to start this blog. But just posting a bunch of my old pictures didn't feel like enough, I wanted to add another element: I decided to revisit each scene as it is today and capture a new image with the same field of view as the original photo. Since the original pictures were made during the six-year period of 1985 through 1990, and the new images during the spring and summer of 2007, we'll be able to examine the effects of a generation. Black and white photographs copyright ©1985, 1986, 1987, 1988, 1989, 1990 and 1994 by Neil J Murphy, except where noted. All rights reserved. 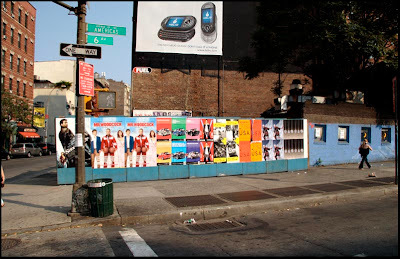 Color photographs and all text copyright ©2007, 2008 by Neil J Murphy, except where noted. All rights reserved.